Indeed Ol Black Lives Matter, Especially the Unborn! (ThyBlackMan.com) Family Research Council is deeply concerned about the status of Black America. That’s why two of our top researchers issued an important study on the present condition of black families. Titled “The State of the Black Family in America,” this February 2015 report was compiled by FRC Senior Fellow, Dr. Patrick Fagan, and lead researcher, Christina Hadford. This report honors the legacy of Dr. Daniel Patrick Moynihan. Pat Moynihan first raised serious concerns about the Black family in 1965. Moynihan, a liberal academic and later U.S. Senator, cried out for help to address the critical issue of family breakdown among minorities and especially among Black Americans. Fagan and Hadford note that the deterioration of family life among Black Americans has accelerated alarmingly. Star Parker is a civil rights activist, whose Board of Advisers I chair, is leading a new generation pro-life activism within the Black community. She, and they, envision a future that is not dominated by liberal elites who are uniformly pro-abortion. Journalist Paige Winfield Cunningham, writing in The Washington Examiner, details the story of increasing civil rights activism among pro-lifers. In “Black Babies Matter,” in the Examiner’s September 28, 2015 edition, Cunningham writes of Ms. Parker’s CURE initiative. Many of this new generation of pro-life activists recently took part in a significant event at the Edmund Pettus Bridge in Selma, Alabama. This site is vital to the history of all Americans as the location of Dr. Martin Luther King’s great march for voting rights in 1965. Figures from the federal Centers for Disease Control show that black women are subject to abortion nearly three times as often as white women and nearly twice as often as Hispanic women. The rate is 30 per 1,000 black women. In New York City, home to the largest black population of any U.S. urban area, more black babies are aborted than born. 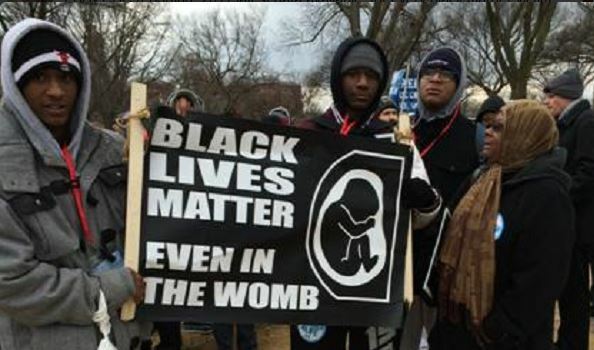 New York’s Department of Health and Mental Hygiene reported in 2014 that black babies constitute 42% of all abortions in a city where blacks are 25% of the population. In Georgia, where whites outnumber blacks 2 to 1, more than 53% of abortions involve black babies, and black women terminate their pregnancies at nearly 2.5 times the rate that white women do. How can this be? Black Americans are the most churched of all Americans. The Black church has provided the leadership of the civil rights movement. Dr. King was emphatic on this point. He wanted Americans to know that his SouthernChristian Leadership Conference was fully in line with the best of America’s godly heritage. To highlight this appalling situation, Family Research Council’s Senior Fellow, Bishop E.W. Jackson recently led a group of pastors and civil rights supporters to the steps of the National Portrait Gallery. I joined Bishop Jackson there to protest NPG honoring Margaret Sanger. She was the founder of Planned Parenthood. Read the rest of this article at ThyBlackMan.com.